Great experience! Great building supply company! I flip homes and my most recent project became a much larger undertaking than I'd imagined. I couldn't have completed it without all the help I got from Lakeland! They explained my options, helped me sort out design decisions and really kept my costs down. We ordered windows, siding, vanities, doors - whatever we could, from them! We are very happy with our experience working with Rod at Lakeland Building Supply! From start to finish the customer service has been top notch. Our new cabinets were delivered on time and in perfect condition. Any questions I had were answered immediately and thoroughly. I highly recommend them for kitchen remodel projects! 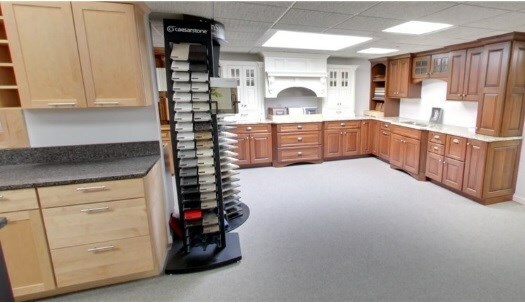 We used Lakeland for the final design and procurement of our Laundry Room & Kitchen Cabinetry. Everything was correct and accurate. Our cabinets are Omega Dynasty Smokeyhills Stained Maple, and we love them. Lakeland made the process quick EASY and we paid a very fair price. I recommend them to ANYONE looking to remodel and want to deal with competent professional courteous knowledgeable people. AT extremely great pricing. Andy was spectacular! In 1988 we built our house and bought the Mid Continent kitchen and bath cabinets. After raising 5 kids and a dog in this house the kitchen cabinets look very, very good. The vanity is in very good shape but the medicine cabinet will have to go. Besides, the med cabinet is now dated. My husband and I would buy these cabinets all over again. They sure have stood up to a lot. Luckily we don't need new kitchen cabinets at this time and we are now remodeling the bathroom. Wish we would have looked at Lakeland first. My experience with Lakeland from the initial showroom consultation to the delivery of goods was WONDERFUL! There was great communication (via e-mail and phone) and customer service was top notch! Not to mention, their prices could not be beat. Much appreciation to Dave and Wayne! We found Lakeland by accident when we had to get our siding project done in a hurry; Greg who we worked with was more than happy to get us taken care of in the short time we had to get the job done. Steve did a great job handling our product with care when he delivered it, earlier than expected, what a great surprise that was. We chose the stacked stone panels; they were reasonably priced and fit the budget. I have to tell you this product ROCKS!!! (no pun intended) it is easy to work with, handled well in the January weather, granted it was in the 30's and low 40's that week, none the less it is easy to cut, and yes I was able to do it, place and interlock the pieces to secure them, it looks AMAZING!!! I definitely recommend Lakeland and this product, Thanks Greg for all you did!!! we had some problems with our windows after they were installed by our builder. I called Lakeland Building Supply and I was very impressed with the prompt personal attention we received. A service tech was at my house in WI within two days of calling, he was also very professional and worked very efficiently. I also received a follow up call to make sure I was satisfied. I would most definitely recommend Lakeland Building Supply! This is the first time I have used Lakeland, but not the last. Their prices where reasonable and the service excellent. They helped me make the correct selection for the job and when some of the composite was not up to standard they took action and replaced it the same day. The aluminum siding on the rear of my house was damaged during a recent wind storm in the Gurnee area. My insurance company was unable to find matching siding and was only willing to pay for color matched painted siding to make the repair. I was referred to Lakeland by a neighbor. I contacted Lakeland and spoke with Wayne. Wayne was helpful right from the beginning and located the exact siding to match my house. He immediately put a hold on the siding until I could arrange for a contractor to do the work. I then asked if he had anyone that he could recommend to remove and replace the damaged siding. I was referred to Gordan Kennedy. Gordon was one of the most honest, reliable and hard working guys I have had the pleasure of working with. He does excellant work and is reasonably priced. Thank You Lakeland, Wayne and Gordon.